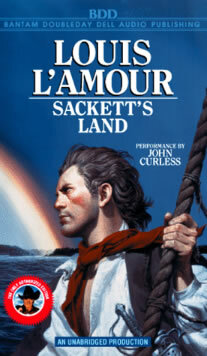 Sackett's Land Research Papers explore Louis L'Amour's novel that at first takes place in seventeenth century Enlgland and then moves over into the New World. Although Louis L’Amour’s novel Sackett’s Land is billed as a Western, the reality is that this story—which is the first in a series that follows the Sackett men—begins in seventeenth century England and does not have the traditional overtones of a classic western. Despite this fact, however, L’Amour’s examination of life in during this time period provides a vivid picture of the radical differences in culture between England and the American colonies. As such, the novel is both an adventure and a tale of personal development and revelation. In the opening of the novel the reader is introduced to Barnabas Sackett. A poor farmer who lives in rural lands of England, Sackett is blessed to find some gold coins unearthed on his land during a rainstorm. After deliberation, Barnabas decides to sell the coins, although he realizes his transaction must be kept confidential due to the fact that suspicions may be raised regarding the origination of the coins. To this end, Barnabas seeks out a man by the name of Hasling. Through his dealings with Hasling, Barnabas comes into contact with an English nobleman by the name of Genester. Unknowingly, Barnabas offends the nobleman and, as a result, Genester seeks revenge through murder. Realizing that his life is in danger, Barnabas decides to leave the England for the New World. Taking the money he acquired through selling his coins, Barnabas decides to purchase goods for trading hoping he can establish himself as trader once he arrives in the colonies. To Barnabas’ misfortune, however, he is captured by pirates carrying out order from Genester to kill him. While aboard the ship, Barnabas is able to befriend two of the ships crew members. Through this process, Barnabas is given the opportunity to escape before his is killed. Although he is alone in the New World with no money or possessions, Barnabas strikes out to make his way in the world. Empty Land Research Papers look at a classic western novel that explores the greed and violence caused by wealth of an overnight mining town. The Minutemen and Their World Research Papers look at Robert Gross's book about the American Revolution, but told in a new technique of 'new social history'. Paper Masters writes custom research papers on Sackett's Land and explore Louis L'Amour's novel that at first takes place in seventeenth century Enlgland and then moves over into the New World.